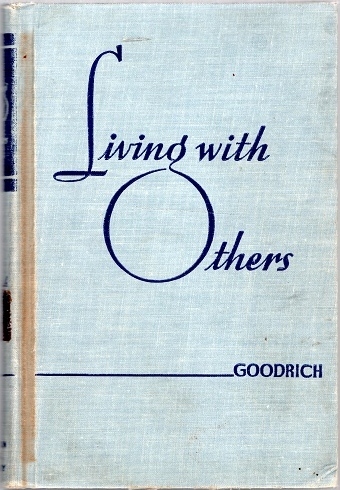 In the foreword to Living with Others: A Book on Social Conduct, Laurence B. Goodrich writes that "the art of making and maintaining pleasant and effective human relationships is one that can be learned. 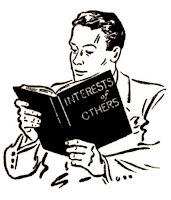 In the pages that follow, the reader will find discussion of those attitudes and techniques essential to gracious community living." Although this is a typically charming book of the era, even starting with an epigraph by Jonathan Swift and an anecdote about Theodore Roosevelt, for me the charm of this book is in its adorable line drawings illustrating its many salient points about conversation, hospitality, behavior and correspondence (sadly not credited to any artist--come on, American Book Company!). See below an image from the chapter on conversation. Learn from Merle's excellent example! Practical Goodrich points out in the first chapter, "The Good Mixer", that "persons unskilled in the diversions which furnish activity for social get-togethers are a source of uneasiness and perplexity to those who wish them well." What does he recommend? "Learn to ride horses, sail and row boats, drive cars, paddle canoes, shoot guns, handle tools cook, sew, knit, build fires, and wash dishes....The more things we know how to do, the better we are likely to mix." Oh yes, and don't forget: "A well-dressed mind is just as essential to social success as a well-dressed body." One more image I love: This is actually from the "Appearance Counts" section of the book. This image is meant to illustrate that "well-dressed means suitably dressed. School and office are not the places for cast-off party dresses, nor are street and store the proper setting for sun suits and lounging pajamas." 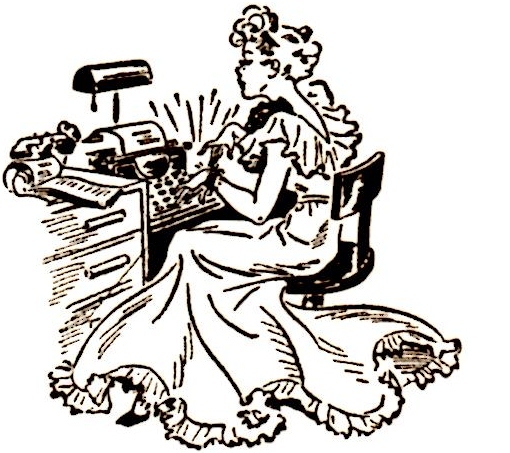 However, I love this image because it's how I always imagined a lady author of a certain era dressed to write. Being an author looks like such fun! Although this is a fun, chatty book filled with anecdotes and quotes, the charm is all in the illustrations. A few years ago (pre-scanner), I (probably illegally) took the book to Kinko's and made writing stationery by copying these images onto some lovely writing paper I bought an estate sale. What part of that doesn't make me feel and sound one hundred years old? Copy machines? Writing paper? Sigh. It was adorable stationery, though. 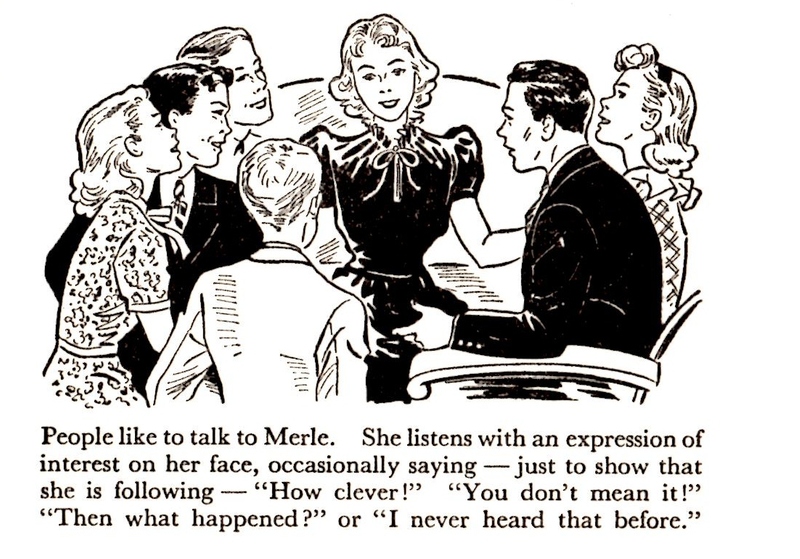 These illustrations remind me of Vera Neville's work. Check out a Maud Hart Lovelace Betsy-Tacy book - the first four in the series were illustrated by Lois Lenski, but all the rest are charmingly illustrated by Vera Neville. 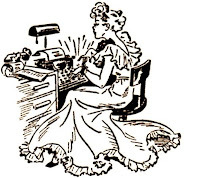 The books take place in the early 1900s and the writing is timeless.